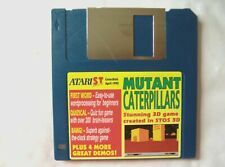 Atari ST User - Mutant Caterpillars. Cover Disk Only, Original Atari ST Software. This is for use on Atari ST. This item is Used as in the photograph. Manufacturers part number . Atari ST User - Flipped. Cover Disk Only, Original Atari ST Software. This is for use on Atari ST. Manufacturers part number : March 1992. This item is Used as in the photograph. Cover Disk Only, Original Atari ST Software. This is for use on Atari ST. Manufacturers part number : July 1991. This item is Used as in the photograph. Disk 28 ST Format - Mig-29M Superfulcrum / Fractals. 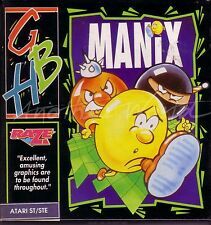 Cover Disk Only, Original Atari ST Software. This is for use on Atari ST. Video format : PAL (UK Standard). Manufacturers part number You will receive the product in the photo provided. 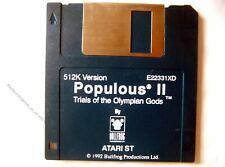 Populous II Trials Of The Olympian Gods. Original Atari ST Software. This is for use on Atari ST. This product is sold as genuine. This item is Used as in the photograph. Manufacturers part number . • Original box. Very Good (VG) More than one or two slight defects. Still in collectible condition. Original Atari ST Software. This is for use on Atari ST. Rainbow Islands. This item is Used as in the photograph. Manufacturers part number . Disk 32 ST Format - Knightmare / Kozmic. Cover Disk Only, Original Atari ST Software. This is for use on Atari ST. Video format : PAL (UK Standard). Manufacturers part number . Hard Drivin'. This is for use on Atari ST. This item is Used as in the photograph. Manufacturers part number . This is for use on Atari ST. Sleep Walker. This item is Used as in the photograph. Manufacturers part number . Disk 59 ST Format - Mouse KA Mania / Pothole 2 / Videomaster. 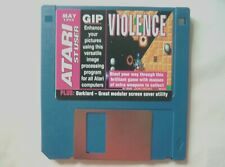 Cover Disk Only, Original Atari ST Software. This is for use on Atari ST. Video format : PAL (UK Standard). Manufacturers part number The photo displayed shows a genuine item. This is for use on Atari ST. Combo Racer. This item is Used as in the photograph. Original Atari ST Software. This is for use on Atari ST. Fun School 3. This item is Used as in the photograph. Manufacturers part number . Disk 66 ST Format - Stardust / Endurance. Cover Disk Only, Original Atari ST Software. This is for use on Atari ST. Video format : PAL (UK Standard). Manufacturers part number You will receive what is shown in the photo provided. Issue 11 Atari ST Review - Breakthru. Cover Disk Only, Original Atari ST Software. This is for use on Atari ST. Manual included : No. Manufacturers part number The listed product is original. Atari ST User - Prodata / Oxyd / Fatcache. Cover Disk Only, Original Atari ST Software. This is for use on Atari ST. Manufacturers part number : November 1993. This item is Used as in the photograph. Disk 17 ST Format - Captive / Fselect / Puzzler. Cover Disk Only, Original Atari ST Software. This is for use on Atari ST. Video format : PAL (UK Standard). Manufacturers part number . Issue 21 Atari ST Review - Enhance Your ST. Cover Disk Only, Original Atari ST Software. This is for use on Atari ST. Manual included : No. Manufacturers part number . Cover Disk Only, Original Atari ST Software. This is for use on Atari ST. Disk 42 ST Format - Knife ST. Video format : PAL (UK Standard). Manufacturers part number . Disk 44 ST Format - Grav 2 / Picture Concept. Cover Disk Only, Original Atari ST Software. This is for use on Atari ST. This is a genuine product. The photograph shows the product you will receive. This item is Used as in the photograph. Issue 27 Atari ST Review - Mastercad / Kobold. Cover Disk Only, Original Atari ST Software. This is for use on Atari ST. Manual included : No. Manufacturers part number You will receive what you can see in the photograph above. Disk 64b ST Format - Personal Pascal / Vector Pro. Cover Disk Only, Original Atari ST Software. This is for use on Atari ST. Video format : PAL (UK Standard). Manufacturers part number You will receive the product in the photo provided. Cover Disk Only, Original Atari ST Software. This is for use on Atari ST. Manual included : No. This is a genuine product. The photograph shows the product you will receive. Atari ST Review - Teamworks Publisher 2. Cover Disk Only, Original Atari ST Software. This is for use on Atari ST. Manual included : No. Manufacturers part number . Cover Disk Only, Original Atari ST Software. This is for use on Atari ST. Manufacturers part number : June 1991. This item is Used as in the photograph. Atari ST Review - Easy Draw 2. Cover Disk Only, Original Atari ST Software. This is for use on Atari ST. Manual included : No. Manufacturers part number . Atari ST Review - First Word Word Processor. Cover Disk Only, Original Atari ST Software. This is for use on Atari ST. Manual included : No. Video format : PAL (UK Standard). Manufacturers part number .